Note: AAEA: "What A Good Energy Policy Means To Blacks"
On Monday, December 3rd, the leaders of America’s top African-American advocacy organizations and other influential individuals will meet in Washington, D.C., to collaborate on national priorities for the coming Presidential term. This gathering is being convened by Marc H. Morial, President & CEO, National Urban League, Rev. Al Sharpton, National Action Network, Ben Jealous, NAACP, and Melanie Campbell, National Coalition for Black Civic Participation. At least 50 leaders will be in attendance. A special press briefing will be held immediately afterward to discuss the outcomes of the meeting at 1:30 p.m. in the Congressional Room of the Capital Hilton, 1001 16th Street, NW, Washington, D.C.
Danielle Moodie-Mills is the Senior Manager of Environmental Education Campaigns at the National Wildlife Federation (NWF). Danielle joined the NWF team in 2010. In her Storytelling Video Diary Series, Danielle shares why she left the classroom and being a teacher to fighting for policy changes that will impact kids around the country. Danielle Moodie-Mills was named to The Root 100 for 2012, a list of the top African American influencers ages 25-45. The Root is an online source of news and commentary from an African-American perspective, and is owned by the Washington Post. Crystal Good is a writer poet. Quantum Christian. Tunk player. Libra charmer. Underdog cheerleader. Affrilachian Poet and native West Virginian Crystal Good reads "BOOM BOOM," a poem reflecting on strip mined mountains and women who take off their clothes for money. Good says, "I see the mountain as a woman. This poem is about strip mining as much as it is about gender. A heavy equipment operator working on an above ground mine site is doing what he feels he has to do -- sometimes life doesn't give us many options and sometimes the consequences of few employment options are more than we expected. It's hard for a stripper to reclaim her reputation -- it's impossible to put back a stream or a mountain top once it's gone." As a member of the Affrilachian (African-American- Appalachian) Poets, she has been a featured poet/speaker at several universities and colleges. “Valley Girl” is her first book of poetry. The poems explore themes in quantum physics, Appalachian culture, gender equality, and mountaintop removal. She is dedicated to growing opportunities and the quality of life for West Virginians with the hope of spreading the perseverance of a Mountaineer across America. Crystal Good lives in West Virginia with her three sons. To order a copy of Valley Girl, contact Good at crystaldawngood@gmail.com . Kelvin Doe builds many other things too. The 18th session of the Conference of the Parties to the United Nations Framework Convention on Climate Change (UNFCCC) and the 8th session of the Parties to the Kyoto Protocol is taking place from Monday, November 26 to Friday, December 7, 2012 at the Qatar National Convention Centre in Doha, Qatar. 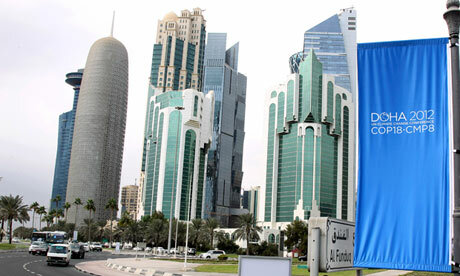 The United Nations chose the Qatari capital of Boha as the location for this year's round of climate change talks. Qatar is the world’s biggest per capita emitter of greenhouse gases. 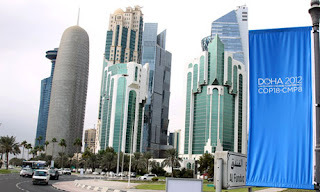 The Intergovernmental Panel on Climate Change (IPCC) will be taking part in the Doha Climate Change Conference (COP 18 / CMP 8) with a wide-ranging programme of events as it prepares to launch the first part of its Fifth Assessment Report (AR5) in September next year. The Chairman of the IPCC, Rajendra Pachauri, addressed the gathering. A $100-billion-a-year promise from rich nations — including Canada — to help poor countries deal with climate change is still unfunded as of the end of 2012, a new report shows. And a second fund, meant to jump start the promise, will run dry by Dec. 31. Canada has given $400 million a year for the last three years to the latter climate fund to provide a down payment for poor countries to begin the work of cutting emissions and adapting to the inevitable effects of global warming. But that fund drew only three years’ worth of financial commitments from donor countries, for a total of $30 billion that will be drained by year’s end. The larger promise made by rich countries in Copenhagen in 2009 to raise $100 billion a year by 2020 is not going to happen. The $100 billion figure must not be an empty promise nor the Green Climate Fund an empty bank account. The two-decade-old U.N. talks have not fulfilled their main purpose: reducing the greenhouse gas emissions that scientists say are warming the planet. The goal is to keep the global temperature rise under 2 degrees C (3.6 F), compared to pre-industrial times. Efforts taken so far to rein in emissions, reduce deforestation and promote clean technology are not getting the job done. A recent projection by the World Bank showed temperatures are expected to increase by up to 4 degrees C (7.2 F) by 2100. Across the country, in the final decades of the 20th century, minorities were moving into suburbs in unprecedented numbers. But Prince George’s County was distinct: It was one of the few places—like Southfield, Michigan, outside of Detroit; Warrensville Heights, Ohio, outside of Cleveland; and DeKalb County, Georgia, outside of Atlanta—that grew wealthier as it became blacker. Median income in Prince George’s outpaced the national median from the 1970 census forward. Even families who aren’t losing their homes have seen values drop, making it more difficult to get loans to finance their children’s education or their retirement. If there’s anything to be gained from this economic downturn, maybe it’s the realization among black people that they are not rooted in wealth the same way as many whites and Asians are, and that since we don’t have the resources that they have, we can’t behave as they do – not yet anyway. 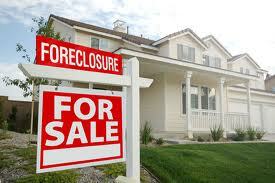 Maybe this downturn will create in African-Americans the desire to create real wealth, not just the faux wealth that exists in home equity and second mortgages. 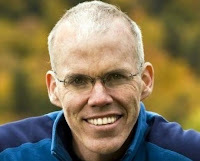 I oppose a carbon tax because it would be regressive (hurt the poor and middle class). I believe a carbon tax would have a negative effect on the black community, which is already reeling from 16% unemployment. Proponents are promoting a rebate from the government to those negatively affected by the tax. I don't trust such a rebate system and I don't want the government bureacracy needed to implement such a cumbersome system. (See the CBO report below though if you want more info). I prefer the now politically unpopular Cap & Trade system where a cap is placed on emissions and the marketplace controls how emissions limits are met. I also do not believe such a program will necessarily significantly raise electricity prices because efficiencies and alternative production facilities can serve to mitigate such increases. If carbon dioxide allowances are auctioned (I prefer free allocation), revenue is supposed to be invested back into effient technologies. Fracking and horizontal drilling have made natural gas plentiful and I think small gas-fired backup generators can now be used to provide a significant amount of baseload electricity. Selective Catalytic Reducers can be utilized to reduce the nitrogen oxide (smog component) emissions. Revenue from the cap and trade program could be used to finance generator installations for virtually all buildings. This is what I consider to be the 'smart grid' because the grid will have to be upgraded to handle inputs from tens of thousands of small generators. Such generators could be remotely controlled by the utilities, providing the certainty utilities like in providing reliable electricity service. Such a system would also signicantly reduce blackouts and storm outages because the generation sources are distributed. Cogressional Budget Office: "Offsetting a Carbon Tax’s Costs on Low-Income Households"
"Pollution Trading and Zip Code Environmentalism"
In a society where the environment that surrounds you is treated like a commodity, we can usually count on most people buying the very best environment for themselves and their families that our incomes and means will afford. That is why in America, your zip code says a lot about your income, your prospects, your life expectancy and your environmental health. So while black and brown people in America see our wealth fast disappearing in a bonfire of foreclosures, poverty zones and long unrequited promises of social equity—it ought to come as no surprise that the non-diverse environmental community is busily creating the latest in a long series of programmatic efforts to ensure that the places where they like to live, recreate, and invest will always get restored, mitigated and protected. Pollution trading is the latest scheme to ensure that existing Federal laws to protect clean and water bypass black and brown communities, even while these so called market tools for the environment would only serve to widen the chasm between the haves and have nots in America. Groups that include the Chesapeake Bay Foundation and the World Resources Institute and others are busily working to authenticate cap and trade initiatives for the Chesapeake Bay region that would allow the worst polluters (statistically located in poor or communities of color) to increase their regulated emissions and discharges to the environment while paying those who presently live elsewhere in relatively nice areas for the privilege to pollute. Also, brokering fees for these transactions will be paid to middle-men known as “aggregators”. Skeptical, check out the Bay Bank: a self proclaimed marketplace where your environment is for sale. Fish habitat? No problem. Wetlands, sure we”ll put it in a box for you. Some Bay conservationists are just as eager to sell the ecology in a fire sale as they are in conserving it. 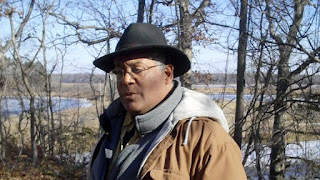 For example predominantly black Prince George’s County might be slated to have the massive coal burning power plant known as the Chalk Point Generating station to increase its discharges of waste into the waters near the black residential town of Eagle Harbor (in Southern Prince George’s). The plant proposes to get state permit to do this in exchange for buying pollution credits form a farmer who happens to live in a predominantly white populated County located several miles downriver. It’s a great deal for the wealthy plant operators, a good deal for the farmers too, who get more cash and no more pollution than before. The black residents of the town? They get added pollution. Trading boosters have no problem with this lopsided transaction. It’s good for the net impacts on the Chesapeake Bay they say. The proponents also argue that this approach to regulating pollution will produce incentives for polluters to clean up their act by giving them additional time and flexibility to comply with the laws while creating fresh sources of investment capital to be used to incentivize compliance with the environmental laws. What they do not say—indeed what they have not even considered is that environmental organization can also get money from these transactions by serving as aggregators or as contractors to conduct restoration projects funded by the trading money. In fact Wall Street brokerage firms are excited about the prospects of selling derivatives and other investment instruments based on pollution trades! Eureka! Pay to pollute. Now there’s a great proposition. Let’s face it. When you monetize the environment then only those with lots of money will have a good environment. But treating your neighborhood like a “marketplace” virtually assures that only good marketplaces will have their environmental health problems addressed. Those with something worth trading will get fresh investment in their communities in derived from “credits”. But those with existing pollution will of course get only “trades” and deferred promises. How could an implausible Ponzi scheme like this one even get on the table? Because the sad truth is the environmental community which panders to the rich and privileged doesn’t think the environment of the region’s black and brown citizens is worth saving. They will quickly inform you that scarce investment dollars go much further in those areas where they like hang out. The "environment" invariably happens to be exactly where they are-- not where we are. Pollution trading is an amazing give-away to the worst polluters in our midst. It perpetuates the idea that you can eliminate pollution while maintaining the same old polluting economy and business practices. It furthers the myth that you can trade something that doesn’t even belong to you. It breaks the faith with those of us awaiting environmental fairness and justice, by instead trading, mitigating and offsetting what remains of our environmental quality into folding money that goes elsewhere and helps build and restore other communities. It is a horrendous miscall and a bad left turn by a conservation community that ought to be embarrassed after 40 some years of vigorous effort to Save the Bay , and even more vigorous funding toward that end, yet it has produced a Chesapeake Bay estuary no better off than when the Bay program was started. So instead of cleaning it up, we will now convert it to cash instead? Right. Public investment continues to go to the more pristine areas of the Bay, to private beaches, country clubs and marinas. Nowhere near the documented hubs of the State’s worst toxic releases, no place near the blight and redevelopment needs of those urban landscapes that also drain to the “bay”; and decidedly nowhere close to where black and brown people disproportionately live work and play. Pollution trading is the latest in a series of deferrals of the Federal Clean Ware Act. If market solutions rely on voluntary incentives then assuredly there is no great incentive than corporate profits. Allowing polluters to the option of reducing their pollution or trading instead, is a no brainer for them. It dooms those of us who are underrepresented in the halls of funded environmentalism to the ongoing legacy and stigma of dirty water and funky air. It is color blind environmental racism at its most brutal and unfair expression. To be clear, I personally oppose pollution trading for legal, equitable and moral reasons, and therefore I will oppose it in any forum where I can do so. The solution to the Bay cleanup is to vigorously enforce the laws—not trade our problems onto less fortunate neighborhoods. But if trading arrives nonetheless, then we the poor, the black, the brown, the economically and environmentally disenfranchised of the areas most underserved neighborhoods, must grab a seat at the table to assure that if trading occurs then it does so fairly and without bias. That if there are “credits” to be had at our expense then we should at minimum get our fair share of them. That if there is a gold mine to be had, that communities of color don’t get only the shaft. And if there is “new money” to being produced for the environment that we must ensure that it does not go the same route as that “old money” that we barely got our fair share of. 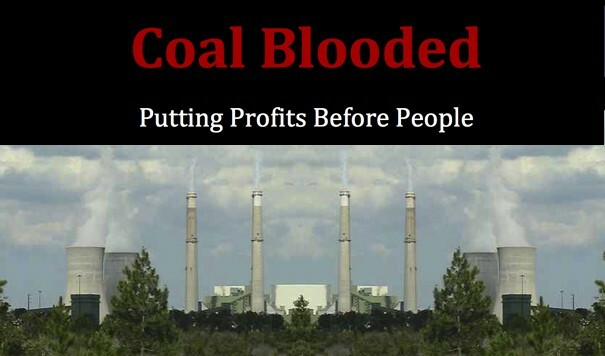 Coal Blooded: Putting Profits Before People is a new report analyzing sulfur dioxide (SO2) and Nitrogen Oxide (NOx) emissions in conjunction with demographic factors –race, income, and population density – to rank the environmental justice performance of the nation’s 378 coal fired power plants. The Energy Summit convenes key stakeholders to raise the voices of people of color on energy policy issues. The Summit provides valuable dialogue with a focus on economic opportunities and the impact on underserved populations. The outcome will lead to a set of principles, which will be presented to key policy officials in Congress, relevant government agencies the Administration and critical interest groups. The Do The Math tour will be in Washington, D.C., on November 18 at 1 p.m. The tour features author and activist Bill McKibben, musical guests, and others, like author Naomi Klein and Archbishop Desmond Tutu, appearing via video. The first major climate change decision that President Obama will face in his second term is whether to approve the Keystone XL tar sands pipeline, which would send 800,000 barrels a day of the world's dirtiest oil to be burned overseas. Right after the Do the Math event on the 18th, 350.org will hold the first major demonstration of Obama's second term, encouraging him to live up to our high expectations and take action to stop climate change by rejecting the Keystone XL pipeline. The march will begin immediately after the event right outside the theater, and head for the White House. According to 350.org, fossil fuel corporations are making record profits, and spent hundreds of millions of dollars on ads on the last election alone. According to 350.org, corporations make all that money because they're able to pollute the air with CO2 for free—while we pay the cost in the form of climate disasters like Sandy. According to 350.org, this event is the starting point for ending business as usual for the fossil fuel industry. AAEA believes fossil fuels should be used in the most efficient ways humanly possible. If the Keystone XL pipeline project is approved, our AAEA parent, the Center for Environment, Commerce & Energy, intends to facilitate a construction contract in partnership with its pipeline partner, S.L. Sibert Management and Construction Company. Black leaders, activists and organizers from around the country are slated to converge on Washington, D.C.'s Howard University, November 14-18, for State of the Black World Conference III (SOBWCIII) -- which is being billed as the first "Great Gathering of Black People" after the re-election of President Barack Obama. Organized around the theme - State of Emergency in Black America: Time to Heal Black Families and Communities, a primary goal of the Conference is to assess the impact of the election on the interests and aspirations of people of African descent. Now that President Obama has been elected to a second term with a solid 93% of the Black vote, what demands, if any, should Black people make on his administration in the next four years to address the State of Emergency? The Conference will begin November 14th with the launch of the Damu Smith Leadership Development and Organizer Training Institute which is designed to hone the skills of "servant leaders and organizers to do vital work in Black communities across the country. The Institute will be limited to one hundred participants. The first public event of the Conference will be a high profile National Town Hall Meeting, November 15,7:00 - 9:30 PM at Cramton Auditorium on the campus of Howard University. Susan Taylor, Former Editorial Director, Essence Magazine, New York; Dr. Marc Lamont Hill, Host of Our World Today with Black Enterprise, New York; Dr. Julianne Malveaux, President Emeritus, Bennett College for Women, Washington, D.C.; Dr. Mtanguizi Sanyika, African American Leadership Project, Houston, Texas; Jeff Johnson, Political Commentator, B.E.T. and the Tom Joyner Morning Show, Washington, D.C.; George Fraser, President, FraserNet, the largest network of Black professionals in the world, Cleveland, OH; Atty. Faya Rose Sanders, Founder, National Voting Rights Museum, Selma, AL; Rev. Dr. Willie Wilson, Pastor, Union Temple Baptist Church, Washington, D.C., and Congresswoman Karen Bass, Congressional Black Caucus, Los Angeles, CA are the confirmed Panelists. Congresswoman Yvette Clarke, Congressional Black Caucus, Brooklyn, NY, and Rev. Al Sharpton, President, National Action Network have also been invited to join the Panel. Mark Thompson, Host of Make It Plain, SIRIUS/XM, and Bev Smith, Host, the Bev Smith Show, Empowerment Radio, SIRIUS/XM will serve as Moderators. The meeting is being organized by Dr. Ron Daniels, President of the Institute of the Black World 21st Century (IBW). 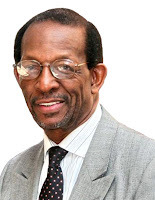 Dr. Daniels is former Executive Director of the National Rainbow Coalition and Deputy Campaign Manager for Rev. Jesse L. Jackson's 1988 campaign for President. He was an independent candidate for President in 1992. For further information or to arrange interviews, contact Carolyn McClair 917.686.0854. A proposed bus depot plan for Ivy City in Washington, DC has triggered charges of environmental injustice against the city. Mayor Vincent C. Gray's (D) announced plan to build a bus depot for 65 D.C-to-New York motorcoaches in Ivy City motivated residents to file a lawsuit to stop it. Empower D.C., a community organizing group, helped residents file a lawsuit in D.C. Superior Court in July to stop the bus depot. The city has filed court papers arguing that no laws were broken in selecting Ivy City for the bus depot. The suit claimed the depot would threaten the health of residents. Mayor Gray’s plan calls for relocating at least 65 charter buses from their berths at Union Station while that facility undergoes a $7 billion renovation, which could take years. Under the plan, passengers would still be picked up and dropped off at the station, but most buses would sit in Ivy City until needed. Ivy City is a 1.7-square-mile neighborhood just off New York Avenue. It was founded by African Americans in 1872. The neighborhood has three liquor stores, two carryouts, a nightclub, a group home, parking lots for school buses and public works vehicles, a halfway house and a juvenile-detention facility. According to locals, about 20 percent of the residents in Ivy City have respiratory problems. The biggest source of exhaust fumes is New York Avenue (Route 50), which is nearly. Although scores of residents are clustered throughout the mix, there is no recreation facility, playground, library, job center (unemployment is near 50 percent) or day care. Because Ivy City is a low-income African American community, residents feel city officials think it is okay to locate this facility here instead of the elsewhere in the city. It measures only 1.7 square miles near the Maryland border in Northeast and has some of the city’s poorest residents, with an unemployment rate approaching 50 percent. Ivy City is dotted with parking lots for scores of government vehicles — quarter-ton snowplows, salt trucks, parking-enforcement vehicles and school buses that belch exhaust as they rumble through the streets. Ivy City is in Ward 5. See AAEA report "Our Unfair Share" to see sources of pollution citywide and in Ward 5. 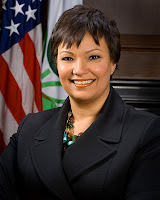 Lisa P. Jackson is the best administrator in the history of the U.S. Environmental Protection Agency. President Obama must keep her in that post to assure environmental protection in the United States. Not only is she equipped to synthesize the myriad environmental regulations into a cohesive green agenda, she does it with a pleasant disposition that even her opponents appreciate. I sincerely hope that Administrator Jackson wants to continue as EPA chief. It was a very tough four years and I watched as she held her ground in testifying before very hostile Congressional committees. Administrator Jackson also traveled the country and the world as the nation's top environmental cop. You know she was effective because both industry and environmentalists complained that she was either doing too much or not enough. That strikes me as bringing a balanced approach to environmental protection. Administrator Jackson successfully navigated a labyrinth of complex environmental regulations from clean air and water to toxic chemicals and children's health. There was the Clean Air Mercury Rule, Cross State Air Pollution Rule, new greenhouse gas regulations, new ozone rules, natural gas fracturing analyses, Renewable Fuel Standard Program, vehicle emissions regulations, underground injection regulations, fly ash containment pond regulations, utility water management regulations (cooling water intake structures), ground level ozone standard, New Source Performance Standards, among other important regulations. These rules could prevent a wide range of serious health effects, including premature deaths, heart attacks and strokes, as well as acute bronchitis and aggravated asthma among the vulnerable, including children and the elderly. Industry has initiated litigation to block the implementation of many of these regulations. Environmentalists have complained that Administrator Jackson has not been aggressive enough in implementing these and other regulations. Again, I think she must be doing something right if the opposite poles are complaining about implementation. 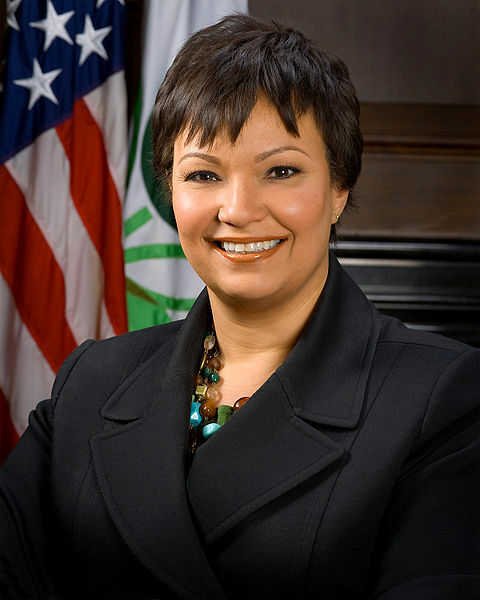 President Obama, please keep Lisa Jackson. Administrator Jackson, the country needs you. I understand the sacrifice this places on you and your family and I deeply appreciate your service. I respectfully request that you give us four more years. Karen Washington has been selected to be one of the Ebony Power 100. Congratulations Karen. EPA Administrator Lisa Jackson and AAEA President Norris McDonald were also selected for the Ebony Power 100. Karen Washington has lived in New York City all her life, and has been a resident of the Bronx for over 22 years. Since 1985 Karen has been a community activist, striving to make the Bronx a better place to live. As a community gardener, Karen has worked with neighborhoods to turn empty lots into community gardens, as an advocate, she has stood up and spoken out for garden protection and preservation, as a City Farms Trainer, she has helped people all over the city grow more food and build healthier neighborhoods, and as a member of the La Familia Verde Garden Coalition, she launched a City Farms Market, bringing garden grown and farm fresh vegetables to her neighbors. Her motto is: you can’t say you’ve made it, if the people around you are still struggling, I am because we are. In addition to her passion for neighborhood revitalization, Ms. Washington is actively involved with the organizations, Why Hunger and Just Food. Both of these civic food organizations work tirelessly to provide New York City communities with healthy foods. 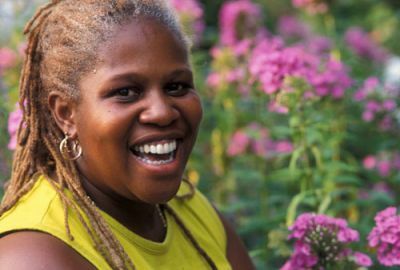 Always willing to lend a helping hand, Ms. Washington also serves as a Just Food Trainer, leading workshops on growing food and food justice to community gardeners all over the city. Along with a litany of community endeavors, Ms. Washington works professionally as a Physical Therapist, demonstrating that it is possible to have a successful career and be dedicated to community service. Ms. Washington has been an inspiration for the residents of New York City and those who seek to bring healthy food to people throughout the country, especially in low-income or urban areas. 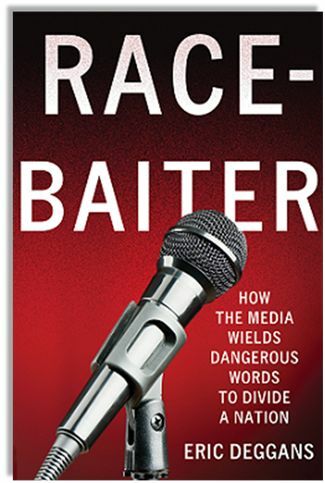 New book Race-Baiter reveals how the media wields dangerous words to divide a nation. “Even as the election of the first black president forces us all to reevaluate how we think about race, gender, culture, and class lines, some areas of modern media are working hard to push the same old buttons,” says author of Race-Baiter, veteran journalist and media critic Eric Deggans, who in this new book dissects the powerful ways modern media feeds fears, prejudices, and hate, while also tracing the history of the word. “Race-baiter” is a term born out of this tumultuous climate, coined by the conservative media to describe those who seek advantage from unfair accusations of racism. Here are nine dangerous words the media uses as featured in Deggans’ Huffington Post column. Eric Deggans is TV and Media Critic for the Tampa Bay Times, Florida’s largest newspaper, as well as a freelance contributor to National Public Radio, CNN.com and the Huffington Post. He has appeared as a pundit/expert on CNN, PBS, Fox News and MSNBC, and his work has appeared in a host of newspapers and magazines ranging from the conservative Newsmax magazine to the Washington Post, Chicago Tribune, Seattle Times, Chicago Sun-Times, Miami Herald and Detroit News, and VIBE, Hispanic, and Ebony magazines. Race-Baiter published by Palgrave Macmillan is currently available in Hard cover [$28.00], and can be purchased via Amazon and Barnes & Noble. We cannot look at the holocaust of mass incarceration as someone else’s problem or something that just affects criminals. The punishment should fit the crime, and when every study imaginable says that black people are more likely to go to jail for the same crimes, this means that Jim Crow is alive and well. Something must be done at the grassroots, state and federal levels. We cannot allow this epidemic to exist any longer. 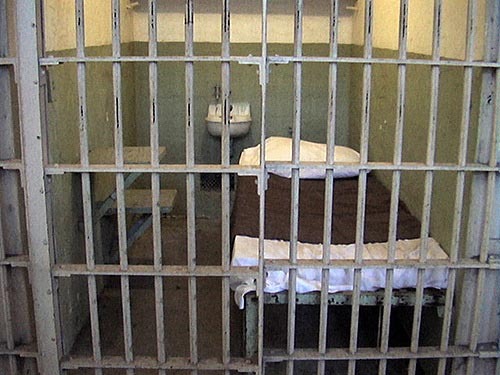 A report has been released at Meharry Medical College School of Medicine about the devastating impact that mass incarceration has on our society. The study, published in Frontiers in Psychology, is one of the most thorough examinations of the impact that mass incarceration has on the African American community. 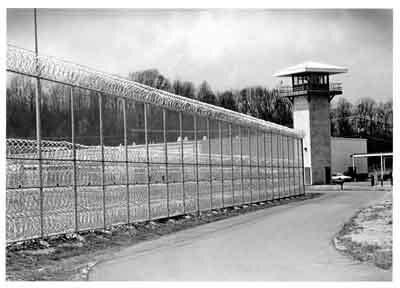 The study’s authors argue that the billions of dollars being spent keeping non-violent offenders behind bars would be better spent on education and rehabilitation. Instead of getting health care and education from civil society, African American males are being funneled into the prison system. Much of this costly practice could be avoided in the long-term by transferring funds away from prisons and into education. 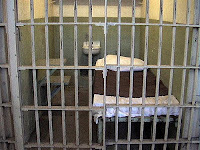 The study’s authors note that 60% of all incarcerations are due to non-violent, drug-related crimes. The authors also note that the cost of substance abuse in the United States is as high as half a trillion dollars per year. Spending money on prevention and intervention of substance abuse treatment programs will yield better results than spending on correctional facilities. Finally, the authors note that while crime rates have declined over the last 20 years, incarceration rates has climbed through the roof. 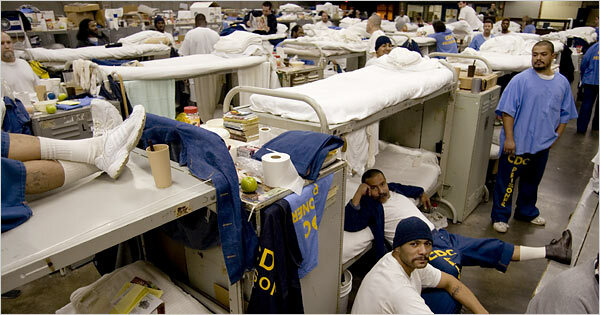 The inmates occupying these jail cells are disproportionately black. In fact, the black male incarceration rate has jumped by 500% between 1986 the 2004. The authors note that, even for those who don’t abuse drugs before going to prison, the likelihood of substance abuse after prison goes up dramatically. President Obama lost the white vote in 2012 by a wider margin than he did in 2008—20 percentage points (59 percent to 39 percent), compared to 12 percentage points (55 percent to 43 percent), respectively. The percentage of white voters this year dropped to 72% from 74% in 2008. This year, 43% of white voters were over 45, 14% of them over age 65. White men made up only 34% of all voters. In 1976, by contrast, they were 46%. 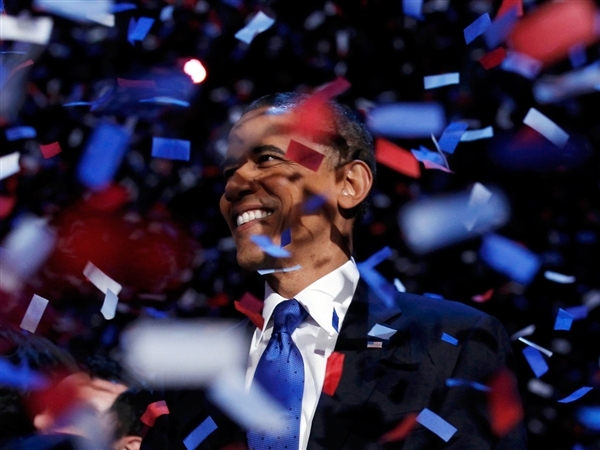 Overall, President Obama received 80 percent support from people of color in 2012, just as he did in 2008. His support among African Americans this year was 93 percent to 6 percent as it was in 2008 (95 percent to 4 percent). His support among Hispanics (71 percent to 27 percent) improved substantially from its 2008 level (67 percent to 31 percent). President Obama carried women by 55 percent to 44 percent, while losing men by 52 percent to 45 percent. This is a larger gender gap than in 2008, when President Obama carried women by only slightly more (56 percent to 43 percent) while doing quite a bit better among men (actually carrying them, 49 percent to 48 percent). President Obama received 86 percent support from liberals (89 percent in 2008), 56 percent from moderates (60 percent in 2008), and 17 percent from conservatives (20 percent in 2008). Liberals were 25 percent of voters in 2012, up from 22 percent in 2008. Conservatives, at 35 percent, were up 1 percentage point from the 2008 level but down a massive 7 percentage points since 2010. Young voters comprised 19 percent of voters this year, up from 18 percent in President Obama’s historic campaign of 2008. Young people ages 18 to 29 years old supported Democrats by a 23-point margin in the 2012 election, 60 percent to 37 percent. 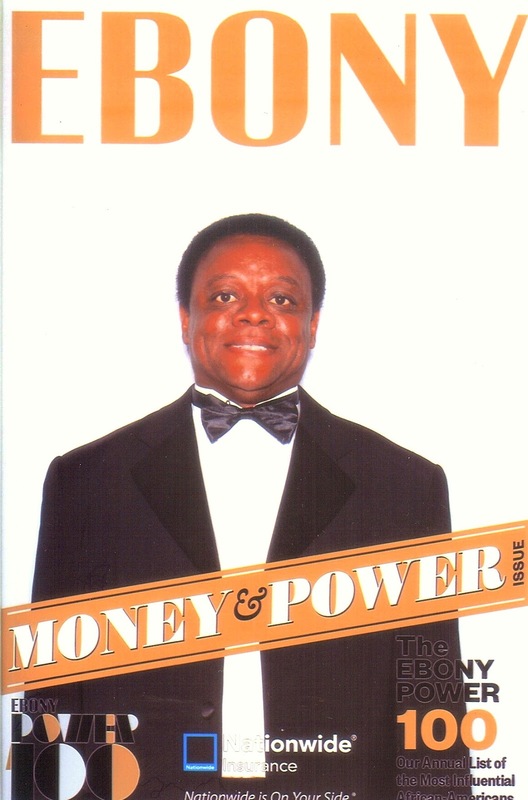 EBONY magazine reveals its 2012 Power 100 list of the nation’s most influential African Americans in its Dec/Jan issue. 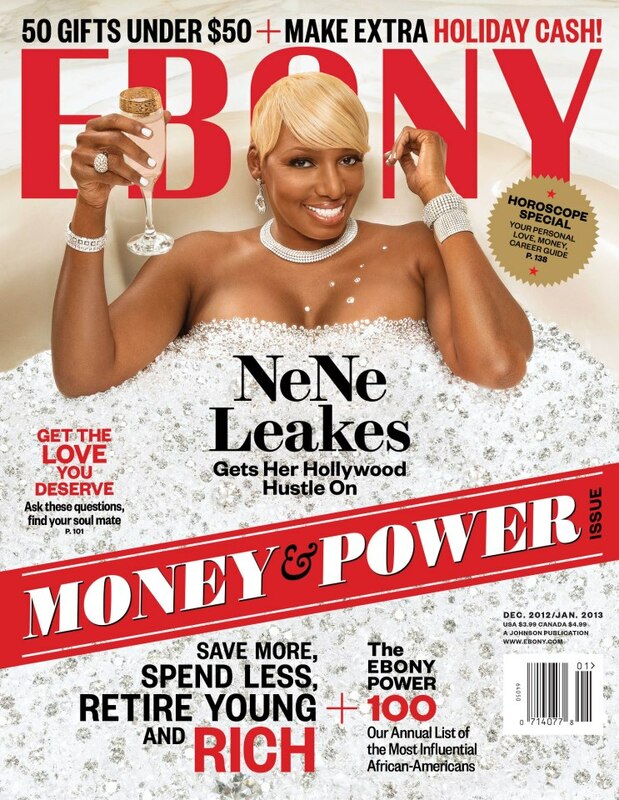 The annual Power 100 is a broad-range listing of politicians and athletes, entertainers and CEOs, and authors. Top players in the worlds of religion, business, media, the creative arts and more are celebrated based on their impactful ideas and influence. 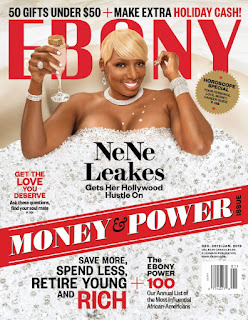 In this issue, EBONY selects the 100 primary influencers and game changers who have made vital accomplishments during the past year. AAEA President Norris McDonald made the Ebony Power 100 for 2012. 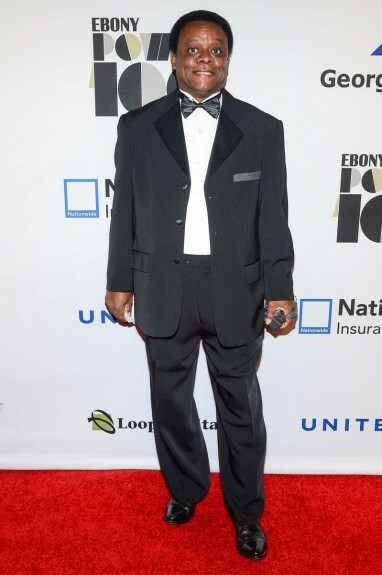 In celebration, the first annual EBONY Power 100 Gala was held at New York City’s Jazz at Lincoln Center’s Frederick P. Rose Hall this Friday, November 2. The invitation-only event featured special performances by Grammy-winning hip-hop band The Roots, classical violinist Brendon Elliott, the Abyssinian Baptist Church Choir, the Black Monks of Mississippi and selected cast from the Broadway musical Fela! Sheri Sheppard and A.C. Calloway were co-master of ceremonies. Prominent attendees and participants included, Richard Parsons, Congressman John Lewis, George Lucas & Melody Hobson, Gail King, Tom Joyner and Vivica Fox, among others. "Before it was easy to be green, McDonald was rooted in environmentalism. 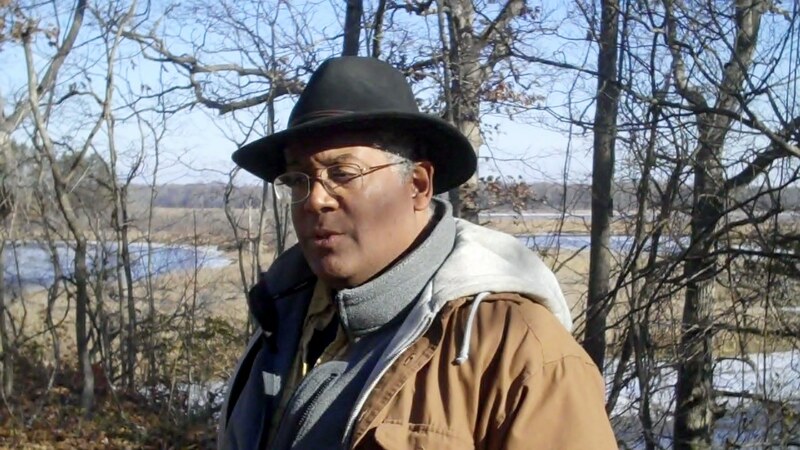 He participated in the White House Forum on Urban Innovation and received The Green Room Energy and Environmental Leadership Award in 2012 for being an African American voice for environmental and conservation policy since the 1980s."